The European Citizens Initiative (ECI)(See Explanatory Note below) for Unconditional Basic Income (UBI) officially ended on Tuesday January 14th 23.59pm, after collecting at least 280,000 statements of support from EU citizens in 28 countries. The exact number won’t be known until collation and official verification of all online signatures and those on paper is completed in mid-February. The initiative did not succeed in collecting the one million signatures required by the European Commission (EC) to win their consideration of UBI as a new form of ‘emancipatory welfare’. “We would like to thank every single supporter who signed our initiative or promoted it,” said Klaus Sambor (Austria), general organizer of the European committee which coordinated this initiative in 28 European countries. During the final weeks there was a huge surge of support. 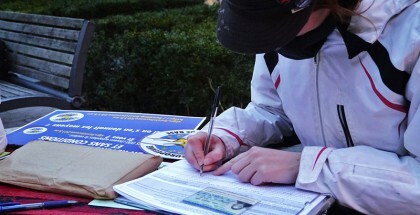 In Bulgaria alone 30,000 signatures were collected in the last 5 days, thanks to an impressive last-minute push by Bulgaria’s leading trade union. “The case of Bulgaria reflects an overall intensification of interest in basic income leading to coverage in leading European media,” Martin Jordo (press officer, Sweden) said. Le Monde, BBC, El Mundo, Huffington Post, Al-Jazeera, RT’s Keiser Report, Portuguese and Bulgarian TV recently carried reports about unconditional basic income and this ECI for it. While the official objective was not achieved, there are many reasons these supporters of a fairer and simpler social security system are happy. Six countries—Bulgaria, Slovenia, Croatia, Belgium, Netherlands and Estonia—reached their signature quotas, and one, Hungary, came very close to reaching theirs. “This ECI is only the start of a European movement towards an EU-wide basic income,” said Sambor. New groups have formed in many countries to support this campaign, and existing UBI networks were strengthened by it. “The momentum generated this year will carry on in 2014 to promote unconditional basic income,” affirmed Stanislas Jourdan, organiser of the ECI campaign in France. A new pan-European network has now formed to pursue the same objective—to promote the practicality and benefits of implementing UBI throughout Europe. The organisers do not intend to launch another ECI in 2014, however. “The current rules are too cumbersome for grass-root groups like ours,” explained Stanislas Jourdan. The organisers said they lost two months of campaigning because of troubles with the implementation of the online collection system, a result of the complicated regulations for ECIs. A request to extend this initiative was turned down by the EC, although such extensions have been allowed by the EC for other initiatives in the past. “We may consider using the ECI again in the future if the rules are simplified, and allow better preparation for the start date,” Jourdan said. He referred to the fact that the EU plans to reform the ECI process by 2015. To show the popularity of the basic income concept and to challenge the shortcomings of the ECI collection system, organisers have now launched an online petition in collaboration with Avaaz.org, a leading political petition site. “We want to play by the rules of the ECI, which is supposed to allow 12 months for the organisers to collect signatures,” Koen van Haalen (online petition coordinator, Netherlands) explained. “The combined results of the two petitions will be delivered to several EU authorities and politicians to support our claim that widespread public support for UBI is emerging.” The organisers are also exploring the possibility of using the signatures collected during the ECI for a standard petition to the European Parliament. The organisers of this ECI will launch a new European campaign before the European parliamentary elections in May. National campaigns for unconditional basic income are also set to be launched simultaneously in several countries. Further actions will be announced on the website for the Initiative: www.basicincome2013.eu and the corresponding Facebook page. (Explanatory Note) The European Citizens Initiative was set up by the Lisbon Treaty as a vehicle for giving ordinary people more of a voice at the European Commission. Each one has to collect one million verified names, addresses, and depending on the country, birthdays or National identification numbers, with at least seven countries reaching their quota of signatures set by the EC. After making an application to EC to do an ECI, the start date is set on the date the ECI is accepted by the EC, regardless of whether the complicated online collection system needed for each one has been sorted out and approved for use by the EC and verification authorities in each nation. Even paper forms were not available until the online system was sorted out. In the case of the ECI for Unconditional Basic Income, this process took over two months after the official start date.